Chief Curator Richard Birkett leads an exclusive ICA Red Members tour of the exhibition Metahaven: VERSION HISTORY. VERSION HISTORY is the first solo exhibition in a major UK institution by artists, filmmakers and designers Metahaven, featuring an expansive new moving-image commission as part of an overview of their hybrid investigations into overlapping geopolitical, technological and emotional conditions. VERSION HISTORY centres on three moving-image works: the newly commissioned feature-length Eurasia (Questions on Happiness) (2018), Hometown (2018) and Information Skies (2016). 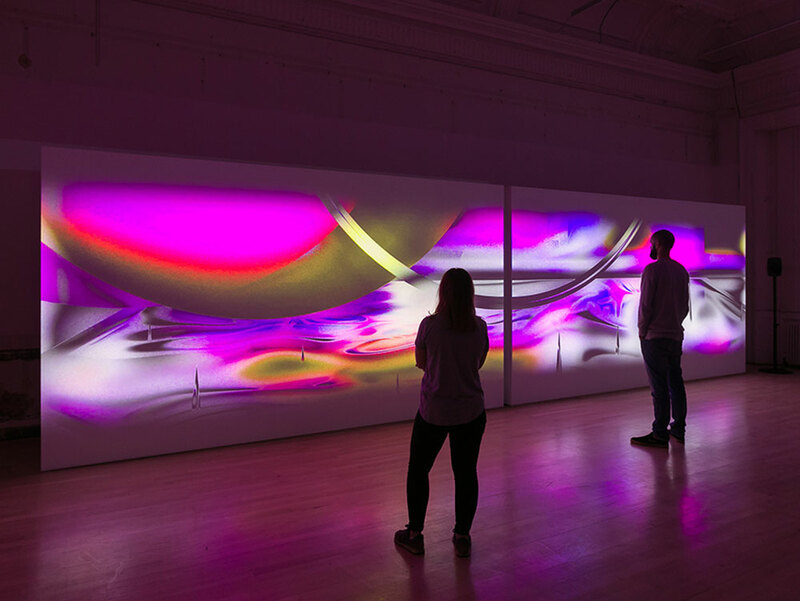 These works share a vibrant aesthetic language that combines cinematic imagery with graphic, animated layers and immersive soundscapes. They are presented within distinctive installations, including a series of murals threaded through the Institute’s galleries, and a hand-tufted carpet. The dual meanings summoned by the exhibition title – both different versions of history and reality and an interface through which these versions are rendered – are at the heart of the three works. Sign up to Red Membership for £16.66 per month here.